One of the biggest blessings of living in a community is having good neighbors—people you enjoy being around and are there when you need them. However, the opposite is true of bad neighbors who can make your life miserable. If you have neighbors who are rude or show a lack of consideration for you and the other people on your street, you might be tempted to react with rude behavior of your own. While this may bring you momentary satisfaction, it could have long-range damaging effects. If you haven't met the neighbor, try introducing yourself, shaking hands, and chatting for a few minutes. Show sincere interest in them. Sometimes this simple act will help diminish animosity in the future. If it doesn't, at least you've taken the high road and done a good deed. If you have a neighbor who constantly complains about your parties, invite them to your next backyard barbecue. Whether they choose to attend or not, they're not as likely to complain when they could have been there enjoying the fun. Does your neighbor have an overgrown lawn, shutters with peeling paint, or siding that needs to be power washed? You might assume that they're neglectful, but there might be a bigger problem that you're not aware of. The family may be dealing with sickness, or their lawnmower broke down and they can't afford a new one. Offer to help with whatever the problem is in a respectful, non-condemning manner. Perhaps you can mow their lawn for them or offer your power sprayer if they don't have one. This lets them know you care about the appearance of the neighborhood, and you're on their side. If they get upset about your kindness, that becomes their problem, not yours. If there are other issues that need to be addressed, try to handle them by addressing them with the neighbor involved. Calling the police on the family next door will only build animosity and will probably drive a permanent wedge between you. You'll be better off letting your neighbor know that you have to get up at the crack of dawn, so you would appreciate turning down the music after 10:00 PM. Be reasonable about this, or you'll find more resistance to your request. In other words, don't ask them to be church-mouse quiet after 7:00 PM. No matter how bad your relationship is with the people next door, gossiping about them with the lady across the street won't help. In fact, it will most likely make the problem worse. If you think your neighbor is weird but harmless, keep your opinion to yourself. However, if there is something more serious that directly affects you, go straight to your neighbor you have the issue with and discuss it. If you live on a cul-de-sac in a family neighborhood, you probably have children playing outside, and they can get quite noisy. Get to know their parents and show kindness to the little ones. If you are nice to them, they are much more likely to be respectful when you ask them to stop squealing so loud. Take an extra step of friendship to soften the times when you ask them to tone down the noise. If you enjoy babysitting, offer to watch the children once in a while so the parents can have a night to themselves. If you like baking, consider making a few extras for the neighborhood children. As these kids grow up, you'll reap the rewards of seeing this kindness pay off. One of the things that can turn an otherwise good neighbor into a nuisance is when their pets aren't tended. For example, your neighbor's dog may leave droppings in your yard, or their cat may get out and dig in your garden. Remember that the animals are doing what comes naturally. It's the owners who need to show responsibility. If you have an ongoing issue with the neighbor's pet, show empathy toward the owner. You might say, "I know how frustrating it can be when you run out of plastic bags to pick up after the dog." One way to deal with this is to save plastic bags, and when you have enough for several days, bring them to the owners. If they were clueless about the issue, you have let them know without coming across as judgmental. A cat digging in your garden is a little more complicated to deal with. You might ask your neighbor if she's aware of the city ordinances about animals being allowed to run loose and add that you'd hate for the animal control department to pick them up. If you live near a preserve or forest, you might also mention that wild animals can harm a domestic cat that doesn't have the instincts to protect itself. If your neighbor doesn't act, go to your local garden center and ask for a product with a scent that repels animals without hurting them. 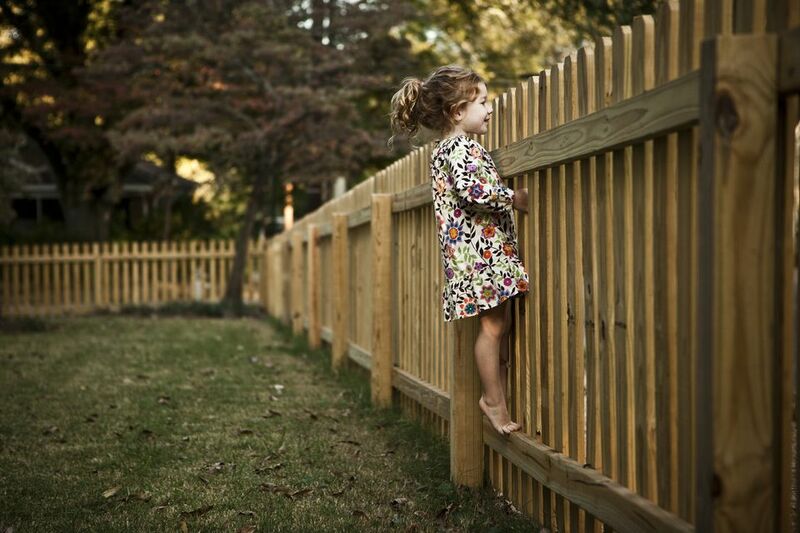 Your neighbor might want to erect a fence, but you're pretty sure he's encroached on your property. The best time to handle this is before a dime has been spent and the work has begun. As soon as you know he's thinking about it, ask if he needs help on determining where his property ends and yours begins. If you disagree on property lines, get together with your surveys and walk it out together. That way, you'll both see the same thing, and you'll be able to come up with a solution together. If you are unable to speak to your neighbor for any reason, write a letter in a non-accusatory tone. Be clear about the issue and offer to help come to an agreement. Try to make it seem as though this is a problem that both of you want to solve. For example, if the neighbor has planted a tree with branches that hang over your yard, offer to trim that part of the tree. Yes, it's more work on your part, but it's probably worth the effort to prevent hard feelings the neighbor will have if you expect more effort on his part. There may be a situation that you can't handle on your own, and you need backup support. If the problem with the neighbor persists, even after you've tried to resolve it personally, let your neighborhood association or city codes department know that there might be an issue in the neighborhood. Most of the organizations will send a letter to the homeowner without mentioning who contacted them. However, be prepared to defend yourself if the neighbor finds out it was you. Each of the scenarios listed above can work if done with the right intent and spirit. However, there are some people who refuse to be reasonable. If you make an attempt to work with difficult neighbors, and they become belligerent, don't put yourself in a dangerous position. You have several choices. You can learn to live with the bad behavior, call the authorities, or move. Just remember that moving doesn't guarantee you won't have a bad neighbor because the new community might have someone who is much worse than what you're dealing with now.